Governor Tom Corbett announced that 131 men and women joined the ranks of the Pennsylvania State Police following their graduation today from the State Police Academy in Hershey. "In years to come, you will look back on this day as the moment you became something bigger than yourselves," Corbett said. "You join a force with more than a century of history. I salute your willingness to take on this calling. You are that part of government we want." Corbett spoke at the ceremony, which was held at Central Dauphin High School. Pennsylvania Superior Court President Judge Correale F. Stevens was the principal speaker and Commissioner Frank Noonan offered remarks. Cadet Mark J. Hydock, of Beaver Meadows, Carbon County, spoke on behalf of the cadet class. Cadet Robert D. Richter Jr., of Holland, Bucks County, was named the outstanding cadet by his classmates and instructors, receiving the American Legion Award. Major John W. Laufer III, director of the state police Bureau of Training and Education, supervised the training of the class, which was the 131st class to graduate from the State Police Academy in Hershey since it opened in 1960. The graduates have been assigned to stations within nine troop areas across the state and will report to their stations on April 11. BRADFORD, PA - Two University of Pittsburgh at Bradford professors have received a $47,400 grant to study the Pennsylvania Wine Industry. James Dombrosky, assistant professor of hospitality management, and Dr. Shailendra Gajanan, associate professor of economics, received the grant from The Center for Rural Pennsylvania. The center works with various government groups and organizations to maximize resources for Pennsylvania's 3.4 million rural residents. In part, it sponsors research projects, collects data on trends in rural Pennsylvania and publishes information and research results about diverse people and communities in rural Pennsylvania. Unlike other grant-giving organizations, the center does not put out an open call for proposals. Instead, the center chooses topics of importance to the state, then solicits proposals from faculty members at the states' rural universities. This was the first-time Pitt-Bradford was eligible to submit a proposal. Dombrosky and Gajanan's proposal was chosen from among seven applicants to conduct an assessment of the state's wine industry. For Dombrosky, the proposal was a natural extension of the doctoral thesis he is writing: "Distribution of Pennsylvania Wine through Restaurants: Barriers and Opportunities." But to determine the industry's current capacity and growth potential, Dombrosky turned to Gajanan. Both thought that their cross-discipline proposal gave them an edge over other applicants. "It was a logical partnership," Dombrosky said. The pair has just begun its research, which will last a year with the help of an undergraduate research assistant. The project will result in not only an analysis of the wine industry in Pennsylvania, but also identify strategies to grow the industry further, and make policy recommendations to the state government. "Winemaking is a big industry in Pennsylvania," said Gajanan, citing a statistic that ranks the state seventh nationally in the production of wine. "The question is, can it get bigger and can the government do something to help it get bigger?" Dombrosky said that the role of the study in potentially shaping public policy sets it apart from a lot of academic research. Far from being an excuse to go winery-hopping, Dombrosky's portion of the research will involve conducting one-on-one and focus group interviews with industry experts, winery operators, grape growers and other stakeholders. As part of the study, the two professors will compare practices and results in Pennsylvania with those in New York, Ohio, Maryland, New Jersey, Virginia, Texas, Arizona and Colorado. Gajanan will look at existing data that can inform policy on production and expansion. "Are Pennsylvania wineries efficient right now?" he asked. "Is it possible for them to increase production without incurring too much additional cost? Right now nobody knows if there are advantages to greater production." WASHINGTON, DC — U.S. Senator Bob Casey (D-PA) today wrote U.S. Energy Secretary Steven Chu concerning gas migration-related incidents in Northwestern Pennsylvania. After the most recent house explosions in McKean County, Senator Casey called for federal help investigating the explosions and in coordinating with local and state officials to protect public health and safety. Of Pennsylvania’s nearly 3.3 million hourly-paid workers last year, 206,000 earned at or below the federal minimum wage of $7.25 per hour, according to data released by the U.S. Bureau of Labor Statistics Thursday. Statewide, hourly-paid workers made up 62 percent of Pennsylvanian’s wage and salary workers last year. Those earning minimum wage or less accounted for 6.3 percent of all hourly-paid workers in the state, up from 4.7 percent in 2009. Last year, 91,000 earned exactly the minimum wage in the state and 115,000 earned less. New Jersey had about 1.6 million hourly-paid workers last year, 31,000 of whom earned the minimum wage and 115,000 of whom earned less. Delaware had 203,000 workers who were paid by the hour last year, 6,000 of whom earned the minimum wage and 8,000 of whom earned less. The sizable number of workers with reported wages below the minimum does not necessarily indicate violations of the Fair Labor Standards Act, because there are exemptions to the minimum wage provisions of the law, the department noted. Marcellus Shale drilling pads are large and impressive, David Sewak told a group of about 60 area residents Wednesday night, at a talk sponsored by the Seneca Chapter of Trout Unlimited. Sewak is the Pennsylvania TU Marcellus Shale field organizer. The well pad area itself may be about five acres in size, Sewak said, but there is also a containment or lined pond for water storage, eight or nine acres in size, and another cleared area four to ten acres in size for parking. Several gas wells may be drilled at a particular site, and each may include numerous horizontal shafts of great length, extending out from the deep vertical shaft, which will create clusters of channels for the freed natural gas to come to the surface. Estimates of the number of Marcellus Shale wells to be drilled in Pennsylvania range from 50,000 to 80,000, Sewak said, and each will impact far more than five acres of land surface. Not only land surface, the landscape and habitat for land dwellers (including the human population), but also air and water will be affected. Land under lease for drilling includes some 700,000 acres of state forest and park land, Sewak said. He used a slide presentation and an industry video to show the horizontal drilling, “perfing” (perforating of horizontal shafts to admit gas) and “fracking” (hydraulic fracturing) processes. Hydrofracking uses vast amounts of water, when employed in horizontal drilling, Sewak explained. Whereas drilling a vertical well might use from 20,000 to 80,000 gallons of water, a well with several horizontal channels would require 2 million to 8 million, depending on the lengths of the shafts. Much of the blow-back water from wells is recycled for further hydrofracking use, Sewak said, but eventually it must be disposed of. Some from western Pennsylvania has been trucked to Ohio, and there some has been injected into very deep wells for disposal. Disposal is a continuing challenge in drilling operations, Sewak pointed out. The only way to remove all contaminants would be by distillation, with solids collected and disposed of in landfills. But Pennsylvania has not required that process, so much of the “used” frack water is treated “by dilution” and discharged into waterways. Sewak used some photo slides to show how land, disturbed and scraped bare to create pads and access roads, becomes subject to erosion and sediment washing, unless care has been taken to provide barriers and protect terrain and streams. The ultimate Pennsylvania destination for some of the pollution will be Philadelphia, Pittsburgh and Harrisburg, Sewak suggested. However, local streams would be degraded for years to come. 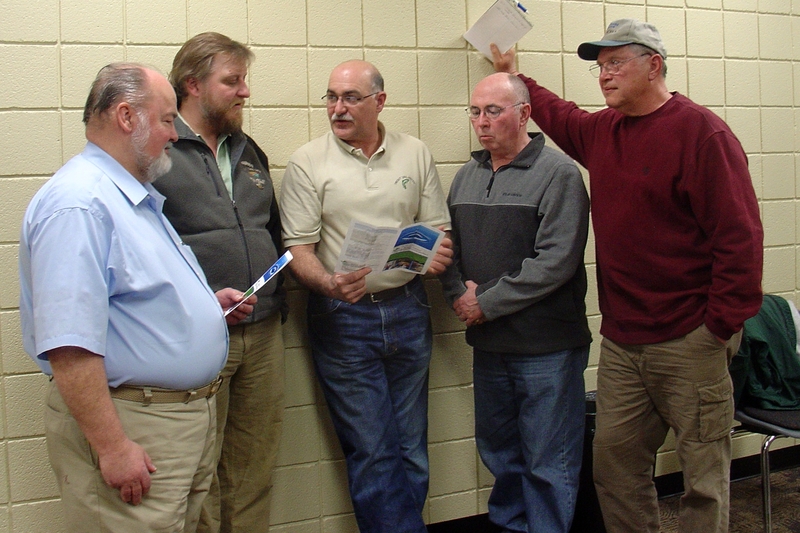 Although the Coldwater Conservation Corps and its volunteers are concerned with protecting local streams which are home to coldwater fish species, Sewak pointed out that the clubs and volunteers are also interested in protecting other streams, including those used by “our warmwater brethren” who fish for bass, muskellunge and other types, Sewak said. Also of concern are deer, turkey, grouse and other wildlife, which were depicted in some slides. He showed ducks visiting streams and marshes, possibly en route to other areas, where some may be “harvested” by sportspersons. If cattle exposed to spills of hydrofracking brines are deemed unfit for human consumption, what about the game that are affected by drilling chemicals and other content of blow-back fluid? Sewak asked. The volunteers use kits obtained through the CCC and undergo training. They can pick the streams they will monitor, but the goal is to cover all area streams. Also involved is the McKean County Conservation District. Watershed conservationist Heather McKean is a point person in that agency. Local naturalist, retired science teacher and wildlife protector Rick Smith pointed to the harmful effects of shale drilling elsewhere, particularly in Texas, as detailed in a recent Pittsburgh Press story. “We haven’t learned from it,” Smith declared, expressing concern about lack of awareness and lax regulations or enforcement. “You will not believe the scope of what is going on unless you visit one of these drilling sites,” Smith said. Smith also likened shale drilling to strip mining. “It’s another money grab,” he said. A number of others in the audience expressed similar concern. Refreshments were provided by the culinary arts program at the Career and Technology Center, and instructor Paul Farmelo and a student were on hand to host and serve the buffet. When supervisor chairman Gary Turner was not at the March meeting of the Liberty Township Board of Supervisors, vice-chairman Chuck Safford explained Turner’s absence by saying that Turner was in Maryland for medical treatment. More recently Kim Turner supplied this update: “We got an answer from Johns Hopkins regarding the Poseidon Study Gary is a part of. From the research study perspective, Gary is participating in a stem cell trial to determine whether stem cells derived from bone marrow can decrease relative scar size and improve heart muscle function in patients who have heart damage resulting from a heart attack. The Johns Hopkins Institute for Cell Engineering (ICE) is one of the top places in the world for cell engineering and embryonic cell research. It is headed by Gregg Semenza, M.D., Ph. D., who got a big award and grant last year from Canada’s only international science award program. There is some cross-pollination between Johns Hopkins ICE and the University of Miami Miller School of Medicine Interdisciplinary Stem Cell Institute (ISCI). Just weeks ago ISCI’s director, Joshua M. Hare, M.D. received approval from the U.S. Food and Drug Administration (USFDA) to begin the nation’s first clinical trial in which autologous (patient derived) stem cells will be compared with donor stem cells for patients with dilated cardiomyopathy. Dilated cardiomyopathy is a condition that causes congestive heart failure. People with the condition are at risk of serious disability; and the condition is life threatening. Dilated cardiomyopathy causes weakness of the heart muscle. Causes include viral infections, inflammation, genetic disorders and “unknown.” Common treatments have included medication to stimulate or improve heart function. Patients whose hearts continue to deteriorate may need heart transplantation. But some are not candidates for that, and for those who are, there can be perilously long waits for donor hearts, and sometimes no suitable one can be found. Patients taking part in the current clinical trial include persons with damaged heart muscle from myocardial infarction (heart attack). The study also aims to examine whether stem cell use may also prove beneficial for other forms of heart muscle damage or weakness. Effects of autologous cells will be compared with effects of allogenic ones (stem cells from donors). In this program, no fetus or placenta stem cells are used; donors are adults. One thing the study is expected to clarify is whether stem cells taken from a patient who is seriously ill might be compromised, and thus not capable of bringing about heart muscle regeneration to the extent needed. But if that were to prove to be the case, use of stem cells from a healthy donor could still be an option. The process involves extracting some of the patient’s bone marrow containing mesenchymal stem cells. The cells are separated from other material and cultivated in a lab for up to six weeks. When donor cells are used, immune suppressive drugs are not required, although the lay public might suppose that would be necessary. Mesenchymal stem cells are immunoprivileged, and there is no need for matching between donors and recipients. Turner’s inclusion in the Poseidon trial has the potential of improving his health, if his stem cells trigger improvement of the condition of his heart muscle. In addition, the results of the Poseidon trial promise to yield valuable new information concerning the use of stem cells in treating heart disease, and could show the way to life saving or extending treatment methodologies that will benefit untold numbers of patients. Those of you traveling through Port Allegany may have noticed activity centered near the intersection of Routes 155 and 6. Those of you not out and about over the past several days will be surprised at what you do see. In an effort to streamline their Port Allegany facility, Pittsburgh Corning Corporation is demolishing what was once known as Plant 5. Plant 5 once held a fabricated assembly line along with warehouse space. The space previously used as warehouse space has been relocated to other space within the P-C campus in the north end of the borough. Andrea Veilleux from the Port Allegany plant provided PAO with a release stating the removal of Plant 5, a 48,000 square foot branch of the Port Allegany campus of P-C, will leave room for "green space", including trees, grass, shrubs and other plant material. Demo was done due to the fact that Plant 5 was in need of repairs/upgrades “to preserves its’ integrity”. The removal of this section of Pittsburgh-Corning’s Port Allegany facility did not affect current staffing positions according to those within the organization. About Pittsburgh-Corning: Pittsburgh-Corning was started in 1935 as Corning GlassWorks, a forerunner to what we know today as Pittsburgh Corning. 1938 saw the first product in the DÉCOR® and ARGUS® lines roll off the assembly line in Port Allegany. Fast-forward fifteen years, the Sedalia operations are consolidated into the facility on North Main Street, Port Allegany, bringing with it the glass block making once done in both facilities. The year nineteen sixty saw space added at 701 North Main Street, Port Allegany. The nineteen nineties saw the demand for glass block continue to grow, resulting in new patterns, accessories and finishing pieces being developed. The most recent information on their website mentions P-C’s affiliate Fresno Manufacturing LLC’s purchase of Cell-U-Foam Corporation of Fresno, TX in 2005. Amy Sorg, CRNP, has joined the staff at Charles Cole Memorial Hospital and will care for patients at the Eldred Health Center. Appointments can be made by calling (814) 225-4241. Sorg earned associate’s and bachelor’s degrees at the University of Pittsburgh at Bradford and Pennsylvania State University. She earned a master’s degree in the family nurse practitioner program at the University of South Alabama. Most recently, she worked as an emergency room nurse at Elk Regional Health Center. She is a member of the American Society of Pain Management Nurses and American Nurses Association. Rep. Martin Causer (R-Turtlepoint) is inviting area residents to join him for “Coffee and Conversation” to discuss the proposed state budget and other issues facing the state and the region. The first session will be held at the Emporium Volunteer Fire Department, 419 N. Broad St., at 8 a.m. Thursday, April 14. The second is planned at the Charles Cole Memorial Hospital Wellness Center, 1001 E. Second St. in Coudersport, at 8 a.m. Friday, April 15. “This is a great opportunity for people to get an update on the latest news from Harrisburg, as well as for me to hear their concerns about state and local issues,” Causer said. Seating for the meetings is limited. People who wish to attend should RSVP no later than April 12 by calling 814-362-4400, 814-274-9769 or e-mailing rrace@pahousegop.com. A dinner-theater will be presented on Saturday, May 14 at the Coudersport Consistory and on Saturday, May 21 at the Veterans Memorial facility near Port Allegany. A revue called “Broadway on the Allegheny” will be presented Friday evening, September 16 in the Coudersport Consistory and Friday evening, September 23 in the Port Allegany Junior-Senior High School auditorium. 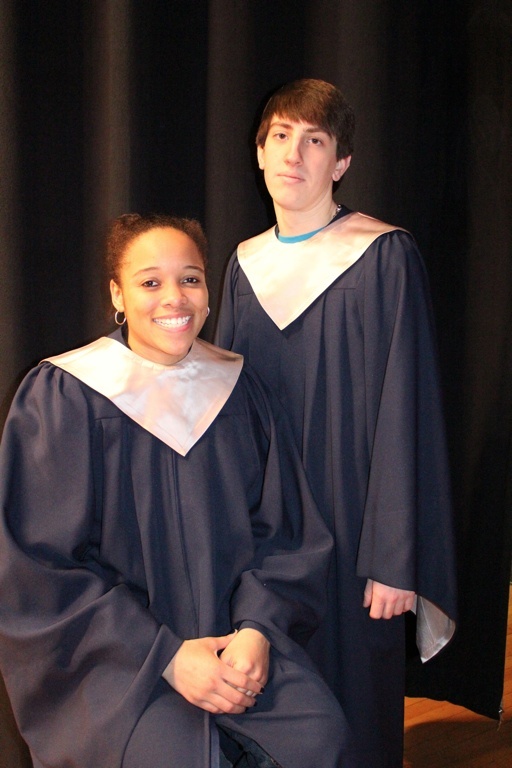 Selected For All-Eastern - Shane Whitney and Renee Edgell will represent Port Allegany High School at the 2011 All-Eastern Honors Choir in Baltimore, Maryland from March 31 - April 3. 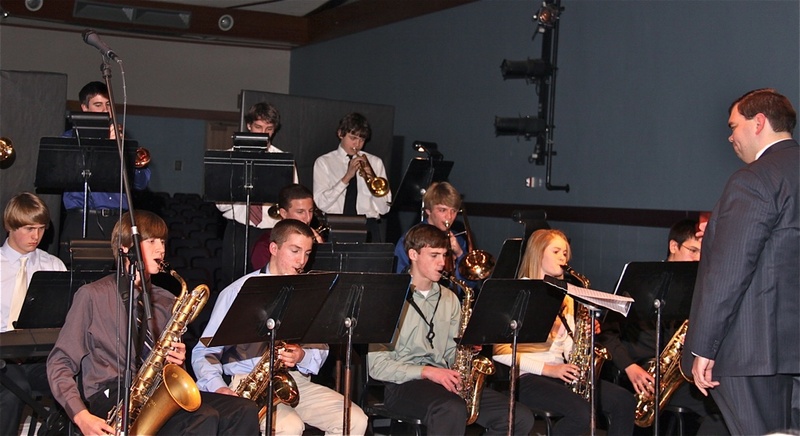 The honors ensemble is sponsored by the Music Educators National Conference (MENC) and is comprised of the finest student musicians from 12 eastern states. The selection process actually began in th fall of 2009 when these students were selected for Pennsylvania Music Educators Association's District Chorus festival, and continued once the students qualified for the Region Chorus in 2010. Both Shane and Renee qualified for the 2010 Pennsylvania All-State Chorus, thus making them eligible for consideration for the MENC All-East chorus. The MENC selection committee met in the fall of 2010 and notified PAHS that both students had been selected to participate in the All-East Honors Choir. Happy 90th Howie! 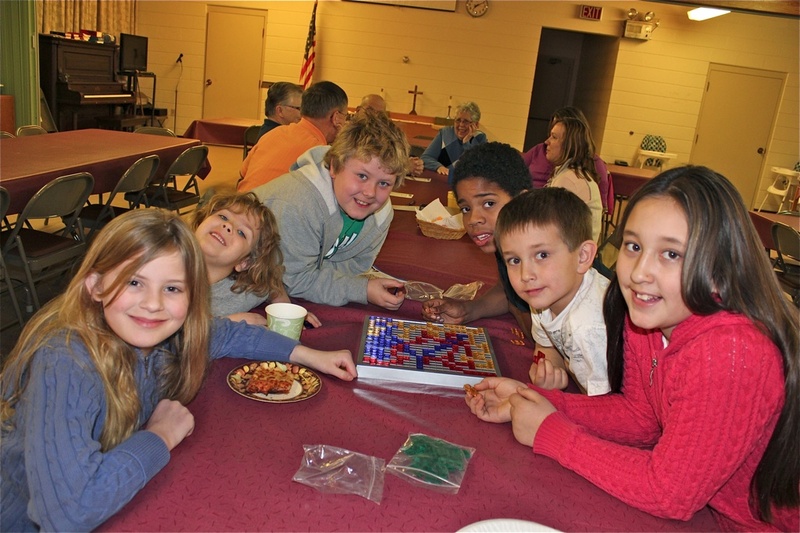 - Four generations of family members joined Howard Gustafson at the Gethsemane Lutheran Church Fellowship Hall after the morning worship service. A luncheon was held in honor of "Howie's" 90th birthday. Pictured (front row, left to right) are Ty Nelson, Mr. Gustafson, Kaileigha Gustafson, Brooke Nelson; (row 2) Brendan Nelson, Patty Gustafson, Nancy Gustafson Nelson, Deana Nelson; (row 3) Mark Gustafson, Maggie Gustafson, Bill Gustafson, Brian Nelson, and Drew Nelson. Celebrates 90 Years - Howard "Howie" Gustafson was the guest of honor at a luncheon held at the Gethsemane Lutheran Church on the occasion of his 90th birthday. Mr. Gustafson is a life-long resident of Port Allegany who had a varied work resume including being an independent contractor. He served in the second World War in Germany and was awarded a bronze star. Mr. Gustafson was working at the local glass factory (Pierce Glass when he was hired, now known as St. Gobain/Veraillia) when he retired in 1983. In 1963, he began writing a weekly column for the Reporter Argus and continues to do so today. For 19 years, he has worked with the Boon Docks Program supervising juveniles as they work on stream improvement for six weeks each summer. Mr. Gustafson is known for his fly-ting skills and his hand-crafted fishing rods. He is also well known for sharing his skills by teaching fly-tying classes and his generosity in donating fishing rods to various groups when they raise funds for community projects. He is very proud of the work done through Trout Unlimited. He is a member of the local group, has been President of the Pennsylvania Council, Vice-President of the National Council and has served as National Director. He and his late wife, Muriel, were married for 64 years. They have four children - Nancy, Jim, Bill and Mark. 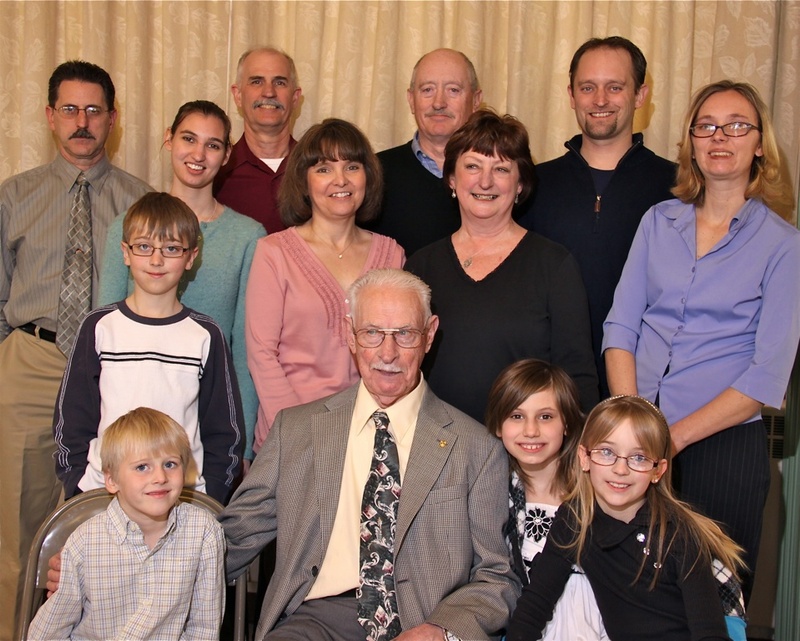 Mr. Gustafson also has eight grandkids and eight great-grandchildren with another great-grandchild due in July. Exchange Student From India Visits - Zoya Rana, a Rotary Exchange Student from India, was the guest speaker at the weekly Rotary meeting held Thursday at the Moose Family Center. The Bradford Rotary Club is Zoya's host club. Pictured with Zoya is program chair of the day, Charlie Cox. ROTARY REPORT - The Port Allegany Rotary Club held their weekly meeting at the Moose Family Center on Thursday, March 24. There were 24 members present for a reportable attendance of 78 percent. 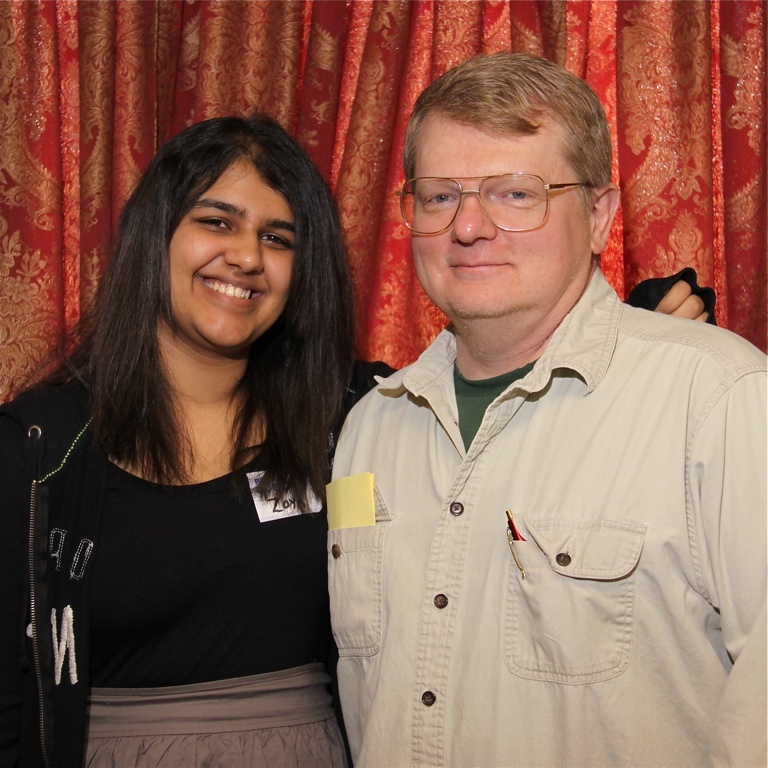 Program chair for the day, Charlie Cox, introduced Zoya Rana, a Rotary Exchange Student from India. She is currently residing in Bradford with the Bradford Rotary Club as her host club. The club will meet at the Moose Family Center on March 31. Their April 7 meeting will be held at the Career Technical Center (Seneca Highlands Vocational-Technical School). Meeting will be held at the same time, 12:15. Program Chairs for April will be Ki Bayline, 14th; Joe Lashway, 21st; and Road Clean up, 28th. The Group Study Exchange Team from Pakistan will visit in Port Allegany from June 12 - 15th. Marty Moses announced that Jordan Edgell and Jacob Stehle were selected to attend RYLA Camp to be held at Westminster College from June 12 - 17. Winner of the 50/50 raffle was Christa Schott. AMWL All-Stars - The Allegheny Mountain Wrestling League All-Star team was announced as follows: (front row, left to right) Trent Neely, 103, Smethport; Nate Schwab, 112, Smethport; Karl Lightner, 119, Smethport; Jesse Wolfe, 125, Johnsonburg; Chet Tanner, 130, Port Allegany; Max Zimmerman, 135, Johnsonburg; Evan DeLong, 140, Kane; (middle) Brandon Ryan, 145, Sheffield; Mark Havers, 152, Bradford, also named Outstanding Wrestler; Ryan Kio, 160, Port Allegany; Mike Swartwood, 171, Kane; Nick Budd, 189, Port Allegany; Luke Wilson, 215, Oswayo Valley; (back) Zach Manning, heavyweight, Port Allegany; Zach Britton, at-large, Bradford; Matt Ostrander, at-large, Bradford; Alex Gular, at-large, Port Allegany; Andrew Fragale, at-large, Cameron County; andn Mike Swartwood, Kane, Coach of the Year. 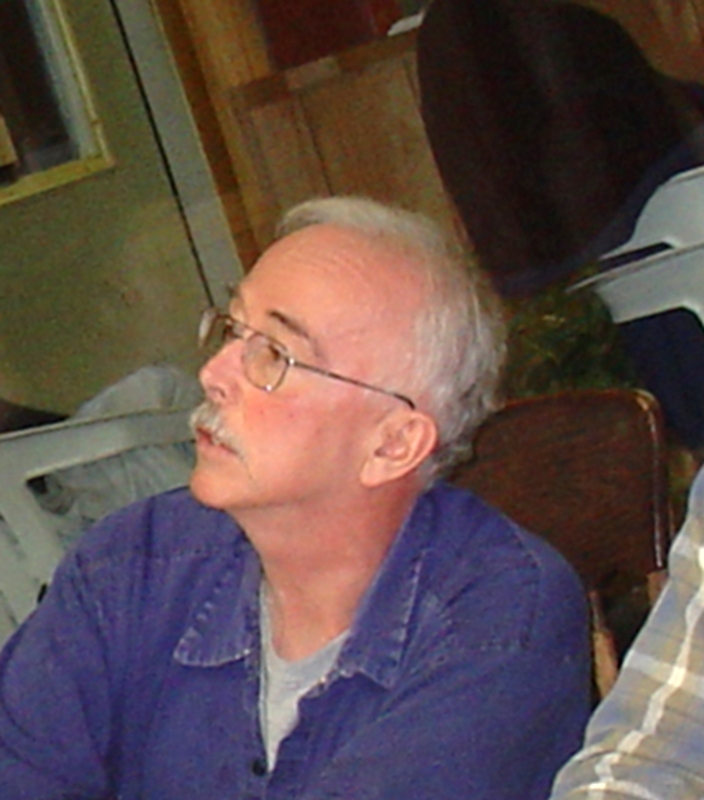 Kyle Bova, at-large, Coudersport, is missing from the photo. North Tier League All-Stars - Named to the NTL All-star team were Camden Nolan, Oswayo Valley; Zach Smith, Smethport; Jason Blose, Cameron County; Ryan Grimm, MVP, Cameron County; Tim McCusker, Coudersport; Jason Gilson, Coudersport; and Brian McCusker, Coudersport, Coach of the Year. Second Team members are Patrick Valenti, Austin; Andrew Sestina, Cameron County; Jared McCutcheon, Northern Potter; Nick Goss, Oswayo Valley; Matt Bodamer, Port Allegany; and Kevin Lord, Smethport. Honorable Mention team members are Joe Holjencin, Cameron County; Andrew Morgan, Northern Potter; Noah Colebert, Otto-Eldred; and Jory Okerlund Smethport. North Tier League All-Stars - Six young ladies were named to the NTL All-star first team. 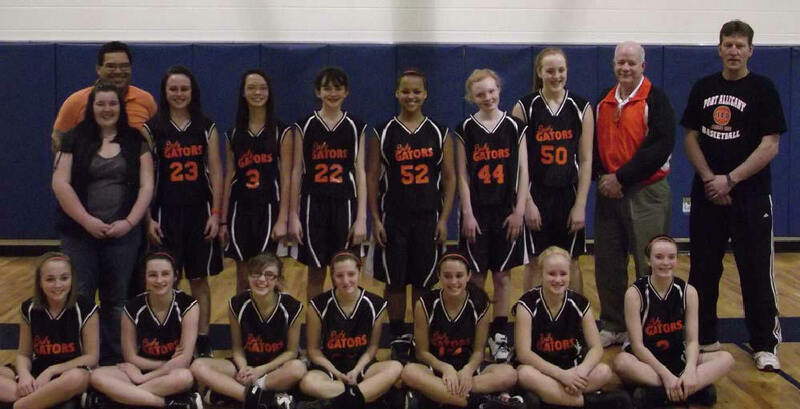 They are (pictured front, left to right) Hannah Fink, Coudersport; Jenna Matzinger, Coudersport; D.J. 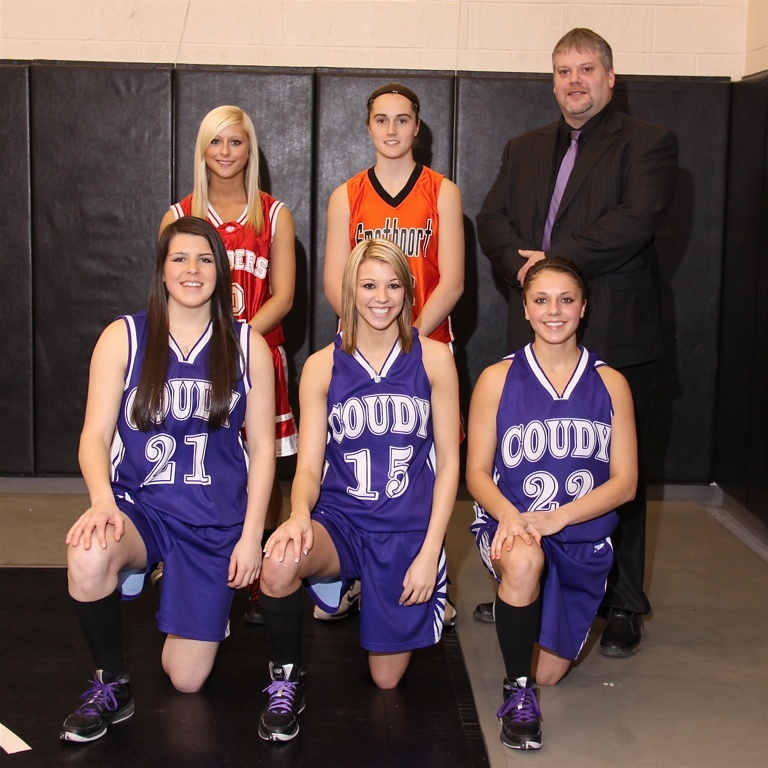 Cowburn, Coudersport; (back) Brooke Dunsmore, Cameron County, Stacey Herzog, Smethport; and Brian Green, Coudersport, who was named Coach of the Year. Also named to the first team, but not pictured is Rachel Taylor, Port Allegany. Selected as co-MVPs were Matzinger and Cowburn. Second team members include Kayla Zoschg, Cameron County; Kayla Woods, Smethport; Katelyn Valenti, Austin; Kyley Mickle, Port Allegany; Tori Brown, Coudersport; and Krystina George, Oswayo Valley. PAHS Softball Returning Letter-winners - First-year Head Coach Dave Morey has seven returning letter-winners for the 2011 softball season. They are (front row) Becky Andrus, Cora Bova, Kris Ann Raymo, Jenny Shelley; (back) Sarah Brodhun, Rachel Taylor and Kyley Mickle. Assistant Coach for the Lady Gators is Willie Daniels.